"Without the gift of Jack and Cathy Foley, I would not have been able to attend Boston College. Their generosity has fueled and will continue to fuel my growth both in the classroom and on the field. They have provided me with the opportunity of a lifetime and for that I will be forever grateful!" Each year Boston College funds 272 full athletic scholarships through a combination of the endowment and Flynn Fund annual support. The greater we can grow the scholarship endowment, the greater the opportunity to utilize Flynn Fund dollars for strategic initiatives and improve the overall financial stability of the athletics department. Endowed funds can be established with a gift of $250,000, payable up to a 5 year period. Click Here to view the scholarship funds and their recipients. Donors making a commitment to an endowed athletics scholarship have the opportunity to name the fund according to their wishes - this can be in honor or memory of a loved one or to establish a family legacy. There is also the opportunity to personalize your fund to match your interests; perhaps to a specific sport or for a student-athlete enrolled in a particular school. Endowed funds established at the $1M level provide the opportunity to restrict, in perpetuity a specific position on a team. For instance one may choose to support the starting running back on the football team. Your endowed fund lives in perpetuity at BC and provides support to a student-athlete. You will have the opportunity to meet the recipient of your fund each year at our annual gathering and watch them as they grow as a student and athlete at BC. You will also receive periodic updates on the performance of your fund, its history and detailed biographical information on your recipient from the Athletic Director. A named financial aid fund may also be established with a commitment of $100,000. The difference is that you would not be able to restrict the fund to a specific sport and the fund would not be assigned to a specific student-athlete. Instead, it would be a part of the general athletics endowment in support of scholarships. Funds in support of operating expenses may be established with a commitment of $100,000 or more and can be designated for operating expenses associated with any of our 31 varsity sports. For instance a basketball operating fund could enhance the annual support of this program funding a special project such as updated film analytics software. 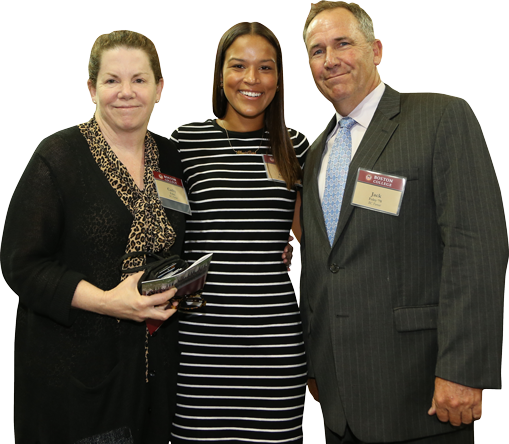 Each Fall, the student-athlete beneficiaries of endowed scholarships have the opportunity to connect with the donors that made their experience possible at the Annual Scholarship Luncheon. In addition, the scholarship donor receives a full report on their awarded student-athlete each year.